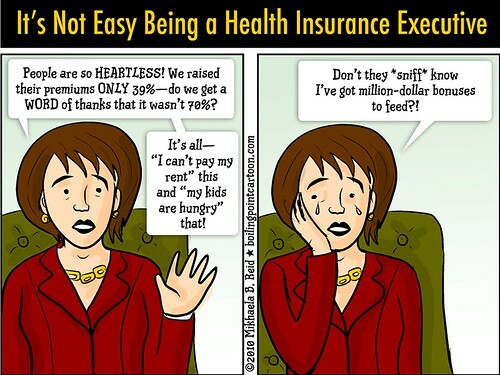 My heart bleeds for this poor health insurance executive... but I won't expect any treatment for my heart. I wouldn't be able to afford it! Really though- its fun to make the insurance companies out to be heartless villains, but really they're simple opportunists. Current government regulation has created mini- monopolies within each state, that allows for this kind of system. Add into that the ridiculous state of tort law (medical malpractice specifically) and you create a system where premiums and the "cost of care" perpetually rise. Let private business compete and reform the malpractice law and this problem will dissolve quickly, without the need to massive government intervention.